Takamatsu is considered to be the largest city in Shikoku, at least for its city core. 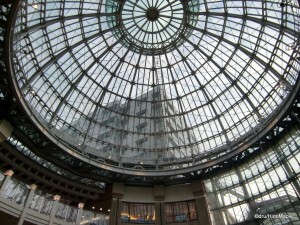 It is also the head of the Shikoku government offices and the heart of business in Shikoku. Upon entering the city, you will realize how different it is from other parts of Shikoku. It is a vibrant city that relies a lot on business to keep it running. Being part of the Kagawa region of the island also means it is the home of the best udon in Japan. While the city is fairly large, it isn’t what most tourists would call, interesting, unlike Matsuyama. There are only two things to really see in Takamatsu, Ritsurin Koen and the Tamamo Breakwater. Ritsurin Koen is a Japanese style park that is also national treasure. It is located about two kilometres from Takamatsu station. The park itself is fairly large. It can be a little difficult to find your way and to see everything quickly. There is an old small tea house located near a red cliff. This tea house is only for viewing as it is no longer in use. The red cliff is probably the most famous image of the park. While it is called a cliff, it isn’t that large, and follows the edge of the park. It is modeled after a similar, albeit much larger, cliff in China. There is also a large tea house located in the centre of the park. This tea house is very nice and located next to a calm pond. Unfortunately, like most tea houses in Japan, it was very expensive. Walking around the park, you can find yourself lining up to climb a bunch of steps to the top of a mound of earth. This mound is called Mt. Fuji. It is said to look similar to the real Mt. Fuji at different times. Unfortunately, I didn’t see it that way, but it is a great place to take panoramic photos of the park. Lastly, you can also visit the gift shop area where you can buy very expensive bonsai trees, or wood carvings. If you have ever been to Shinjuku Gyoen in Tokyo, this park will not be that impressive. It is still a very nice park overall. Behind the station, you can head straight to the pier where you’ll be able to enjoy a nice walk out to the breakwater. 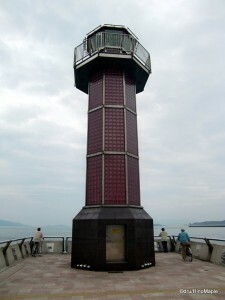 The Tamamo Breakwater is a pleasant walk and the lighthouse is an amazing sight at night. Unlike most traditional lighthouses, where only the top shines, the entire lighthouse glows red. There is also a small park located between the pier and the station buildings. Within the park, if you arrive at the right season, you can visit a very beautiful rose garden with dozens of rose bushes. It makes for a very beautiful and relaxing stroll. 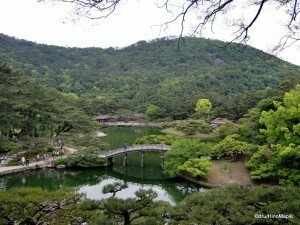 If you have the energy, you can also walk over to the Takamatsu-jo and enjoy the beautiful gardens as well. Unfortunately, the castle was destroyed many years ago, but is scheduled to be rebuilt starting in 2010. If you can wait a few years, you might be able to enjoy this castle someday. If you aren’t so interested in sightseeing, Takamatsu is a very bicycle friendly city. 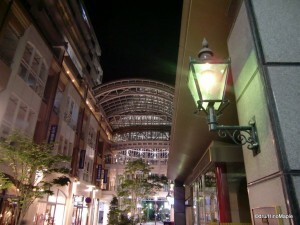 There are several shotengai with various shops in each one. Takamatsu claims to have the longest shotengai in Japan. If you consider a shotengai to be just one street, then this is not true. If you combine them, and the fact that they are all connected, then this is true. Each shotengai street seems to have its own theme. I would recommend renting a bicycle at the station before exploring the shotengai. Unfortunately, I didn’t know about bicycle rentals and went everywhere on foot. Being in the area of Kagawa, Sanuki Udon is very famous. You will be able to find udon in almost every corner of the city. Going to an expensive restaurant is nice, but you can easily find cheap varieties on almost every street. Most of the time, you just order what you want, grab some side dishes, such as tempura, and grab a seat. You can easily eat for under 500 yen. When you have nothing better to do, I would recommend heading to one of the udon shops, grab a quick bowl of udon, and chow down. This entry was posted in Shikoku and tagged bicycle, bicycle friendly city, bonsai, castle, China, Ema Hall, garden, Gyoen, japan, Kagawa, Koen, Kompira, Kompirasan, Konpira, Kotohira, lighthouse, Matsuyama, Mt. Fuji, national treasure, park, pier, red cliff, Ritsurin, Ritsurin Koen, Ritsurin Park, rose, rose garden, Sanuki, sanuki udon, Shikoku, Shinjuku, Shinjuku Gyoen, shotengai, shrine, Takamasu-jo, Takamatsu, Takamatsu Castle, Tamamo breakwater, tea house, udon, wood carving, さんうき, 中国, 四国, 富士, 富士山, 御苑, 日本, 松山, 自転車, 金毘羅, 香川, 高松, 高松所 by Dru. Bookmark the permalink.